I'm very excited to be starting a THIRD year here at Bluestem! 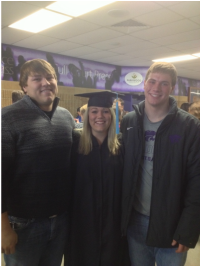 I graduated from K-State in December 2013 after student teaching at Augusta Middle School. I'm originally from Sedgwick but I just bought a house on the east side of Wichita. I am the assistant Volleyball Coach and High School Stuco Sponsor. My philosophy on education is that each child can learn and learns in their own unique way. My goal is to teach my students to be respectful, responsible, reflective, ready, and relentless human beings. We are excited for the new changes this year and our adventures in Project Based Learning. Feel free to contact me by email (sthompson@usd205.com) or my school phone number is 316-742-3281 ext.2123. The best time is in the morning or my plan hour. 7th hour. I look forward to having an outstanding and lively year! 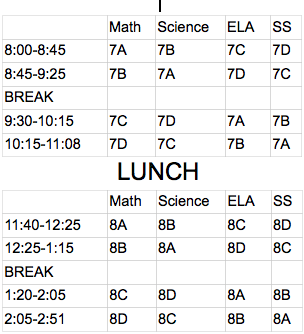 This is the Middle School Schedule.